This is an amazing Ken Spencer figure. He stands a full 40" tall, has all original paint and has the following functions. 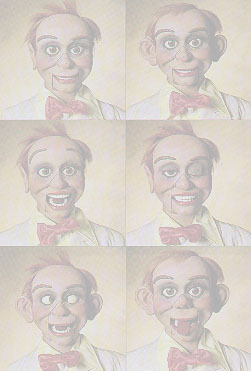 He has Slot Jaw, raising upper lip, side to side moving pupils ( weighted ) , raising eyebrows ( weighted ) , crying effect, wiggling ears, and freight wig. I don't think you will ever see another with as many movements.